KIA'S flagship Optima, such a crowd pleaser for the brand when it was first released in 2011, has slowly lost ground to newer, more improved rivals. 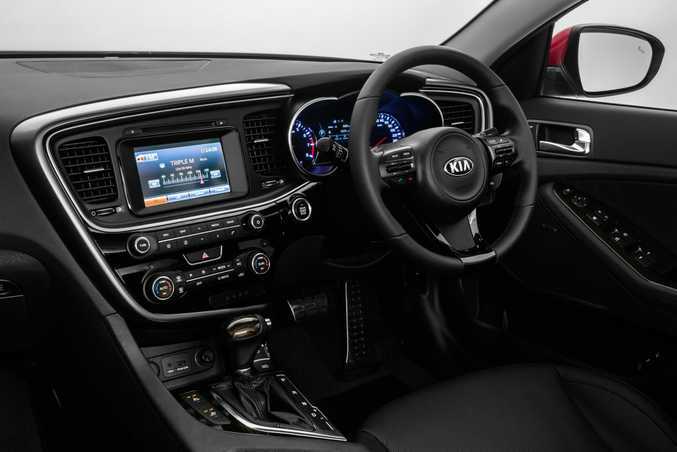 Kia revitalised the Optima last year with an updated interior, a longer inclusions list and a sleeker exterior which should make buyers sit up and take notice of a mid-sized family offering with much to its credit. Designers have used satin-brushed trim highlights and a gloss black console with mood lighting to help pep up the rather spacious interior. The new TFT colour instrument display offers the driver easy access to high-quality graphics and a range of useful information, which is excellent to view but unfortunately does not include a handy digital speedometer. The seats, with climate control and electronic adjustments for the two up front, are comfortable enough and nicely supportive but are a bit less kind to those with broader shoulders. Space has been optimised courtesy of clever design and there feels like oodles of room for all passengers to stretch their legs but a low roofline combined with a beautiful panoramic sunroof did make headroom tighter for taller passengers. The Optima is quite obviously targeted at the family segment and there have been great efforts to help this slant, including easily reachable anchorage points for the kids' car seats, plenty of storage with door pockets that fit real-world water bottles and a boot that would easily hold a reasonable-sized pram and the weekly grocery shop. The Optima retains its old 2.4-litre petrol engine which, while adequate, probably doesn't hold it in the best stead. Road noise has certainly improved thanks to more sound-deadening materials and once it gathers speed on highways is a fairly comfortable drive. This Optima can take a while to get going with not much grunt low down in the torque range, more noticeable when you are carrying more than one passenger but not insurmountable. The suspension, tuned to Australian conditions, still feels jumpy around town, making hard work of bumps and irregularities. While the drive is pleasant enough it is not that engaging, a loose steering offering little feedback and sometimes forcing more than the odd adjustment in the turn. Sometimes it just feels like it needs a bit of oomph to match its external prowess. 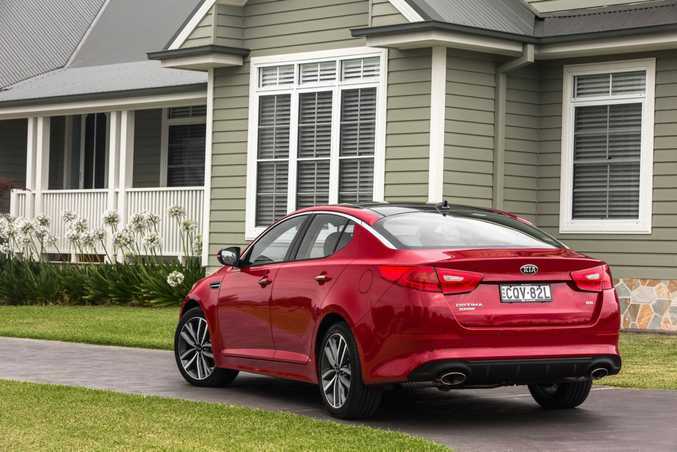 But while it may not show off sporty tendencies, the Optima delivers on the solid performance Kia promises, offering the peace of mind many people search for in a family car. Our top-of-the range Platinum model test car is $9500 dearer than the entry-level model but comes with inclusions that far outweigh that price, such as a digital instrument display, ventilated front seats, a three-spoke steering wheel and a raft of safety and external features to go with the 17.7cm LCD screen with satellite navigation, reverse camera, parking sensors, Bluetooth connectivity, climate control, rain-sensing wipers and a premium Infinity audio system. Safety is five stars and includes a blind-spot monitoring system, lane-change assist, rear cross-traffic alert, as well as six airbags, ABS with EBD and stability and traction control. Unfortunately until the new Optima is released late this year, this model will compete with cars that have had more than just a spruce up, such as the Hyundai i40 Premium (from $42,990), Subaru Liberty 2.5i Premium (from $35,490), the Mazda6 GT (from $46,070 with a new model out this month), Nissan Altima Ti (from $40,490), Holden Malibu CDX ($32,390) and Toyota Camry Atara SL (from $39,990). There is no doubting the Optima has the space, inclusions and safety features that are priorities for family cars. We especially like the rear cross-traffic alert, which is really useful in shopping centre car parks to help pick up errant trolleys and shoppers who often walk nonchalantly across the path of reversing cars. The doors open wide too, making entries and exits easy for older or pregnant passengers. The Optima has room to move here and a new engine will provide the incentive. The claimed 7.9 litres/100km is okay for a medium sedan although we struggled to get that, hovering around 10.5L/100km despite a fair bit of highway driving. Kia's strong ownership credentials, with seven-year unlimited kilometre warranty as well as seven years capped price servicing and roadside assist, are second to none. Exterior changes include 18-inch alloys, xenon headlights and integrated LED running lights, new tail lights and quad LED fog lamps. They work well with the revised black grille and bumper, a reworked boot lid and sporty rear diffuser to add a little sleekness and a few freshening touches to a car that was already doing pretty well in the sedan looks department. 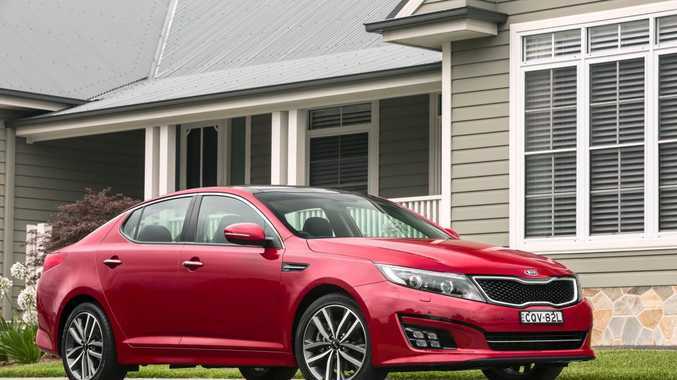 All in all the Optima, with its combination of spacious interior, sleek exterior, an extensive inclusions list and excellent safety features, presents a commendable option for families or fleets looking to change cars. We thought it a comfortable experience despite an aging engine. What we liked: Roomy interior, sleek looks, unbeatable warranty. What we'd like to see: Better fuel economy, zippier engine, less bumpy ride. Warranty and servicing: Kia offers a seven-year unlimited kilometre warranty. Capped price servicing runs for seven years or 105,000km, average price is $380. Servicing intervals are annual or 15,000km. Details: Four-door front-wheel drive mid-sized sedan. Engine: 2.4-litre direct-injection petrol generating maximum power of 148kW @ 6300rpm and peak torque of 250Nm @ 4250rpm. Consumption: 7.9 litres/100km (combined average). Bottom line plus on-roads: $40,990.